In this Invoice Generator System, you can easily setup your Company, manage Customer, manage Products, manage Sales and generate your own company Invoice easily. you can access Invoice system with Mobile, fully responsive experience! 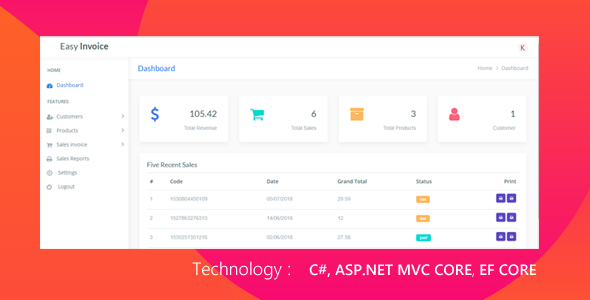 This entry was posted in database-abstractions, net and tagged ASP.NET MVC Core, Csharp, Entity framework Core, jquery by dadmin. Bookmark the permalink.